After much head scratching and calculation I developed several turn template models. 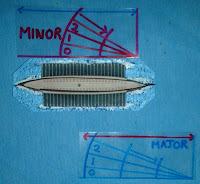 The final version is simplest and smallest while still accurately controlling the ship's movement. 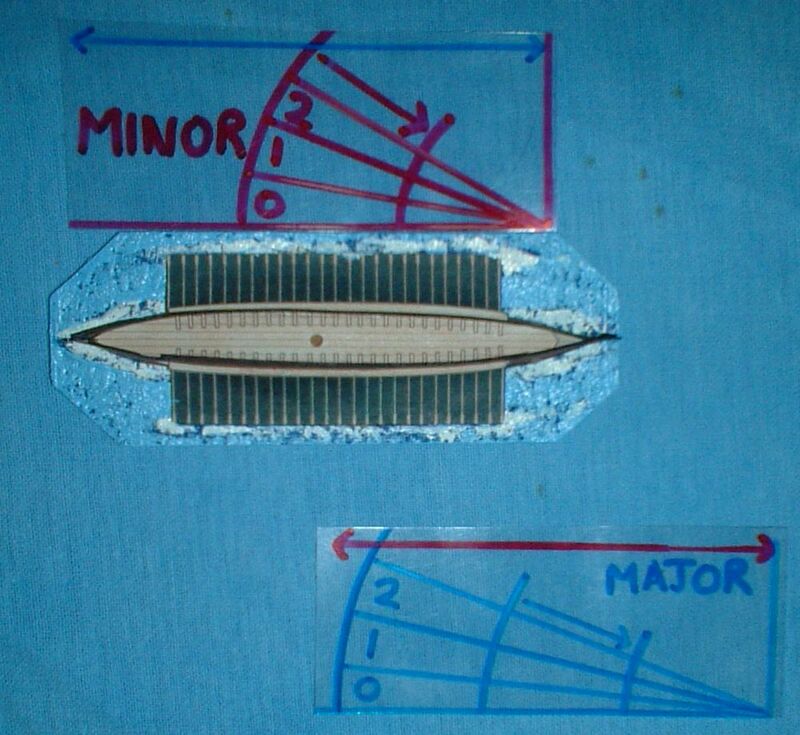 One for each class of ship: MAJOR (3 to 6) and MINOR (smaller) and Alexandrian (Larger). In a single move phase the ship can manouvre in steps of turn 1/3 and advance 1/3. The severity of the turn accumulates 0, 1 or 2 Speed Penalty points. A throw is made to see if the speed penalties cause a reduction in speed of 1 level at the end of that move phase. The long arrows are 1 'ship length' and can be used for measuring straight moves and shots. Command your own warships and ram the enemy ! Don't you love it when the Persians stream onboard ? At the ground scale of Hotz ships (1/300) it is not practical to have a long time scale. With a long game turn the models will simply travel too far each turn and the table needs to be very large. With a shorter turn ships stay within the table area but the trick is find a period within which something meaningful can happen without stretching things too far. 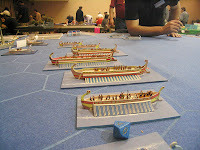 I chose a 'ship's length' : the length of a trireme, as an arbitrary unit of distance. This is circa 35m and roughly equates to a Greek plethron which was 100 feet. The fastest ships can make circa 10 knots in a burst of hyper-energetic rowing. In one minute two warriors can exchange blows with time for one to despatch the other. An archer can shoot several arrows, a light bolt shooter make a shot and marines can run along the deck of a ship some distance. Enough. This was not enough to allow movement to be executed in an interleaved way which gives a sense of simultaneity. For this I chopped the game turn into 5 phases - these ended up at 12 seconds on average - short - but could represent up to 30 seconds at a pinch. Where did the sixth Move Phase come from ? That is a card for FATE. When it is turned players must take a FATE / Random Events card which allows the injection of some atmospheric 'colour'. Then the cards are shuffled and next turn starts. Now what happens in each phase ? 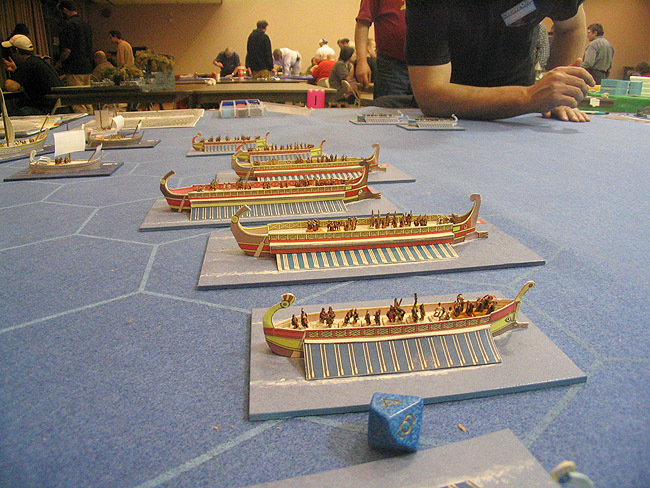 Deciding how to manage movement in an ancient ship wargame is a headache, especially turning. The sea-trials of Olympias give much useable information plus I have some experience on viking galleys - for that is what the longships also are. I started from the basis of establishing the minimum turning circle - Olympias gives us time and angular distance. Larger ships will turn more slowly, smaller ones faster. One thing to remember is that the steering oar swings the stern out as the turn is made so the ship does not go round a turn like a train on a track but holds a tangential position to the arc cut in the turn. 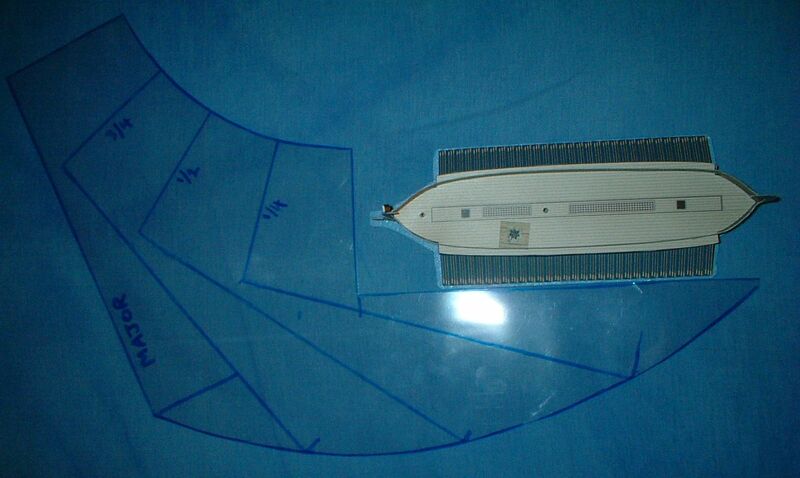 It is possible to calculate turning circles for all ships. Not necessary and tedious. I grouped ships into three classes. 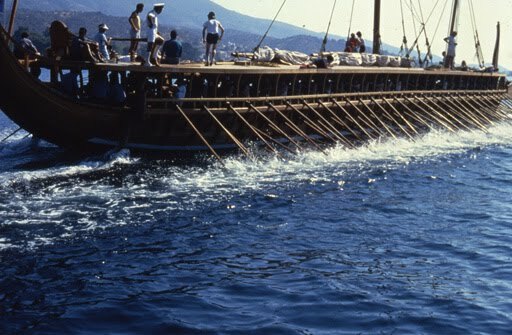 The trireme was the benchmark for doing this. In my rules a ship just has to be ordered to go AHEAD, TURN PORT, TURN STARBOARD or BACK. 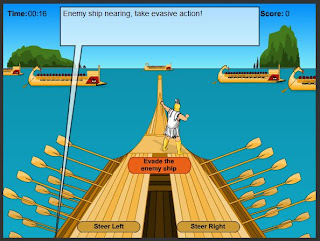 The speed the ship is doing and its crew characteristics then determine how much it can turn, the final move being decided by the player as he moves that ship. The templates are transparent and do not disfigure the playing surface when lying about. I started with heavy perspex templates but changed to flimsy acetate ones which do not mash the ships when things get heavy! A pirate copy may be appropriate for an ancient ship ? An obviously ripped-off copy of Hotz ships (simplified) is available at Junior General. I have commented to Matt at JG and Eric Hotz but the files are still up so I feel no qualms about publicising it. These paper versions are by Eduaro Burca and can be printed quite small and look OK. 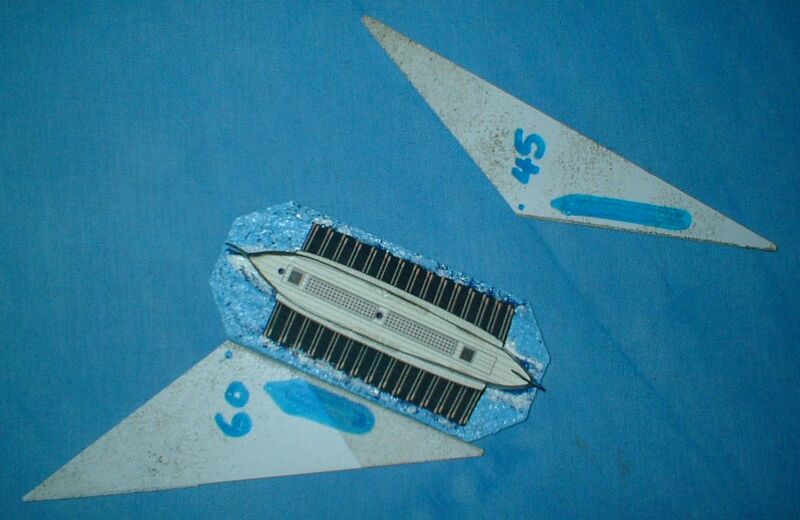 They are not a patch on Eric's originals, shown below, though miles better than other printable ships. After an hiatus I have got back into working on the rules. Test version is downloadable HERE but incomplete. The trireme reconstruction 'Olympias' is to visit New York USA and be refitted. A brilliant account of the Antykithera mechanism. I have chosen to use this as an excuse to involve old-style 'disc calculators in my rules. Some children made this funny version of an ancient sea-battle.